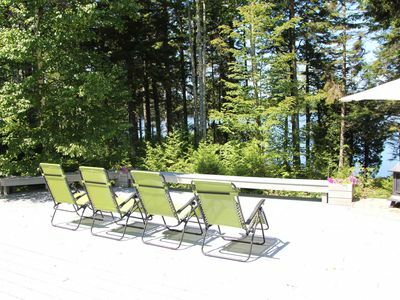 Peace Point is a tranquil 2 bed-2 bath log-sided cottage off a private road on a private peninsula with a view of Flat Bay from every room! 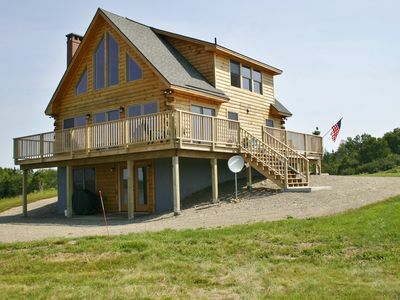 Set atop a granite crop, sturdy hand-railed stairs lead down to the shore. 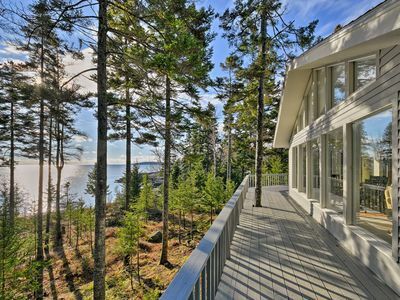 Nestled among balsam, pines, and white birch trees, this cozy retreat offers gorgeous views of the bay where eagles soar and seals visit and is situated so each glorious sunrise and breathtaking sunset is yours. 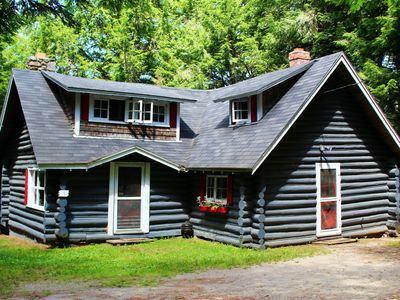 This peace-filled getaway is only 4 miles from town but feels like a million miles from anywhere. Peace Point’s proximity to the ocean lends gracious views of several points including Blasket and Pineo. Eagles frequently nest in the tall pines located on Blasket and a short kayak trip from Peacepoint’s shore to Chamberly Island just around the bend between Pineo and Blasket is the perfect place to view where seals take their rest. A screened porch adjacent to the covered deck is an enticing place to read, reflect, or relax with friends and family. 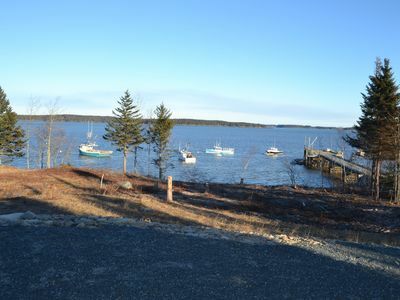 Take in the sea breezes and view lobster boats leaving the bay, their boats piloting past Peace Point’s shore. Flat Bay’s circadian-like tides swing over 14 feet, their ebb and flow a great reminder of the sea’s power and delightful to watch. 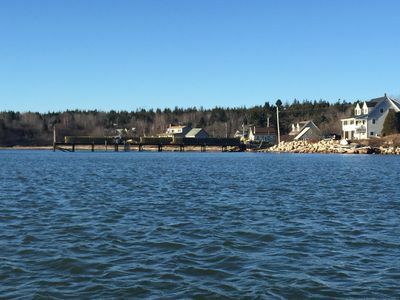 At low tide, when the mud flats are exposed, local wormers and clammers will venture out for a hard day’s work with skids in tow, a marvel worthy of respect at the Downeaster’s ingenuity. When the sun leaves Peace Point aglow and its orange rays and dappled pinks bounce off her white birches, no one is left wanting. The moon will rise above the bay and thousands of seemingly touchable stars light the inky sky. Moreover, from time to time, the vaporous aurora borealis can be a special visitor. Peace Point offers a queen bed in each of two bedrooms, with en-suite baths in both. Each bedroom offers sizeable closets. 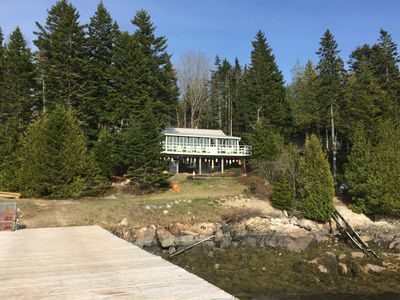 A fully functional & quaint kitchen with gas stove/oven and full size refrigerator opens to the living room where glass doors lead to the deck and a gorgeous water view of the bay. 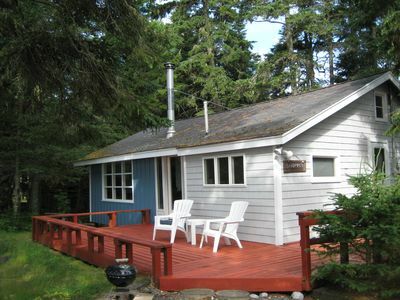 The two bedoroms and a queen sleeper/sofa allows two to three couples or a small family to enjoy Peace Point’s numerous amenities. Two comfortable reading chairs in a little nook by a southern window blowing salt breezes and a puzzle table with music are nearly irresistible. The dining area offers water view and can be expanded to seat 6 with ease. 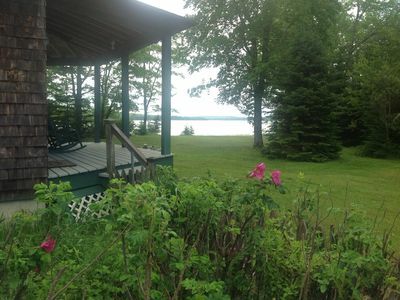 There is a picnic table next to the deck and gas grill. All have bay view. 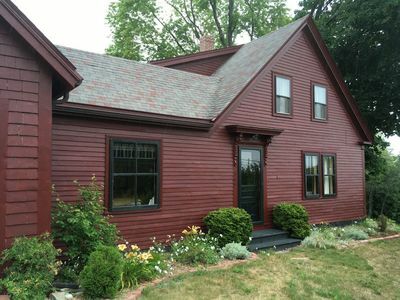 Should you desire to venture into the village of Milbridge, there is a marvelous breakfast and fantastic Downeast food at the Milbridge House. Offering real blueberry pancakes (August is the Blueberry Festival in Machias 40 mins away) and mouthwatering homemade deserts (Chocolate cream, pumpkin, and lemon meringue pie are just a few) or if you get there after 10:45 fresh off the dock seafood - crab, lobster, and melt in your mouth scallops - are yours for a fair price. Hurry, though - these lovely women go home at 2pm and they are closed Mondays. After you’re sated, walk over to the Milbridge Museum and Gallery just to view the really old days of Milbridge past. Or, ride your bikes to McClellan Park (about 4 miles from town center - Automobile Parking/Entry is free, bathrooms are available and camping has a nominal fee). Once there, you’ll walk through the dark balsam fragrant woods which open suddenly to wide vistas of open ocean and wave after wave of crashing salt sprays on deep pink granite crevices and mighty glacial bedrock. 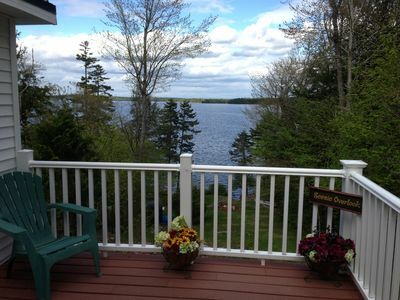 If you have a craving for a sandy beach, bring your pail and shovel, hop in the car and drive to Corea about 30 mins south in the town of Gouldsboro. Park along the street at your own risk as there is no real parking, but it’s a short walk to your sand filled destination. When the beach and sand and sun have filled you to the brim, a few miles away the town of Winter Harbor has a sweet old fashioned “five and dime” hardware store. Bring the kids and rediscover what a tiny toy store should be. Games, books, Jacob’s Ladder, and of course kitchenware, hardware, newspapers etc. Next door, there is an antique store and some local artists works in shops across from the public library. 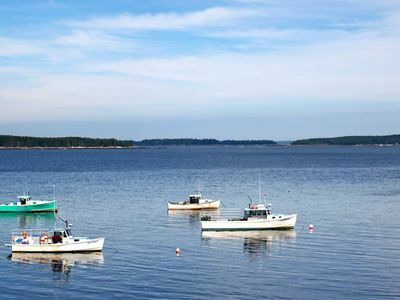 When leaving Gouldsboro, go by way of the Acadia National Park Schoodic Peninsula section. 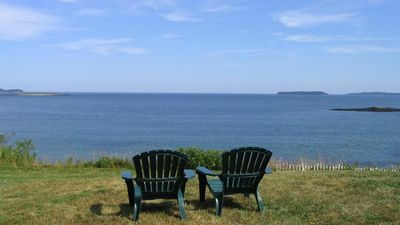 The Schoodic Peninsula is considered one of the most beautiful panoramic views of the sea, it is quintessential Maine and worth the trip. 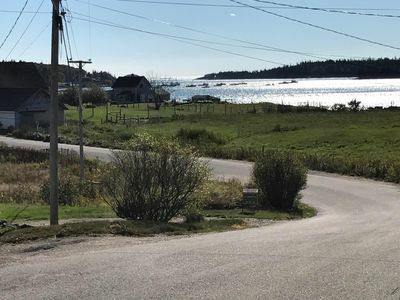 The 10 mile one-way ring road boasts some of the most painted and photographed ocean views, and is a perfect biking trip as well. 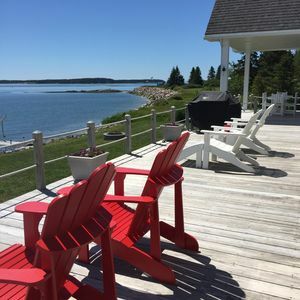 Park your vehicle at the Wrinkled Pickle in Birch Harbor and ride to the park’s entrance at the bottom of the hill and enjoy one of the most beautiful rides in America. When you’ve put your bikes back on the rack, go into the Wrinkled Pickle and have a cold one. Check out this hot spot, everything from pool tournaments, horseshoe tournaments, to jazz depending on the night. Happily exhausted, drive the quiet Route 1 back to Milbridge and Peace Point. Make a note to stop at that little antique place on the right as you’re leaving Gouldsboro. 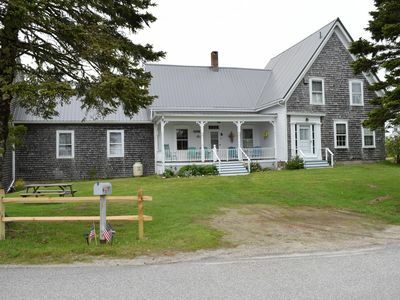 It’s a tiny shop with a gregarious friendly owner and worth a browse of collectibles and vintage used Maine items. Note to self: make room for a wine tasting at The Bartlett Estate Winery, a bit tricky to find but worthy of your time. Stop at the grocery store/hub of Milbridge - Bayside. Pick up ice, water, and food You can also buy wine, spirits, or beer here. The Bayside has everything (but the breakfast sandwiches, coffee, and cranberry orange muffins are to-die-for). Now home at Peace Point, you’ll find a full size washer and dryer for your salty clothes and towels. There’s a tub and a shower too. Relax. 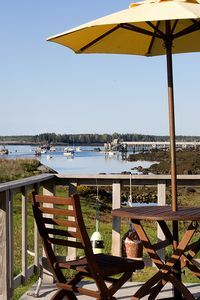 Sit down with a book or draw in the sea air on the screened porch. Decide that the 42” satellite TV can wait and watch the stars make their entrance. Enjoy now. 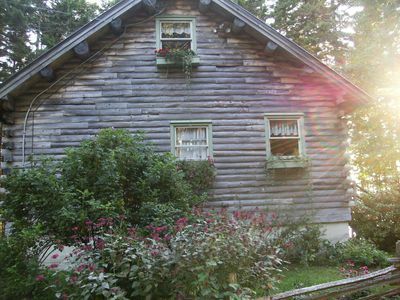 Bring your artistic self and find your muse in this delightful dwelling. We’re so glad to have you as our guests. Peace Point allows well-behaved, adult dogs (limit of 2 dogs). Sorry, no puppies and no cats. Absolutely, NO smoking is permitted. 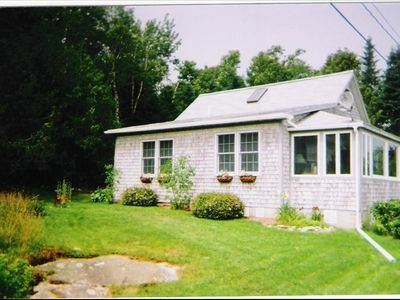 Oceanfront Cottage on 2 Acres - 4 Miles to Town!